The MicroTrukTM is a powerful multi-task truck that offers high performance, safety and comfort. It's equipped with independent wishbone front suspension with coil springs, leaf spring rear suspension with heavy-duty shock absorbers, and heavy-duty tires. Dual backup lights and brake lights increase safety, along with three-point seat belts, four-way flashers, safety-glass windows and more. Drop-down sides and tailgate allow easy access to cargo. Although the MicroTrukTM has one of the largest cabs in the industry, its compact size allows easy maneuvering within small spaces. An optional dump box with scissor-lift makes work in high places more accessible. Des Champs Wringer Systems take in 100-percent outdoor air, wring out the moisture, and supply dry, neutral-temperature air. They satisfy ventilation requirements, while controlling space humidity. Models are available to 20,000 cfm with or without heat recovery. Wringers used in public spaces with ventilation requirements recommended by ASHRAE 62-1999 can benefit from a "divide and conquer" strategy. Use VAV boxes for sensible heating and cooling of recirculated air and separate ducts for the outdoor air supplied by the Wringer to minimize first cost and assure proper ventilation. Des Champs also manufactures plate, heat pipe and rotary heat exchangers. Puddle Pillows eliminate bailing and sweeping away water. Just place the pillow in standing water on athletic fields, playgrounds, parks and other recreation areas. When saturated, remove from the play area and squeeze out the absorbed water. The pillows won't disturb soil or make holes deeper. They are reusable, lightweight and easy to use. Each case comes with 10 pillows, and each pillow can absorb up to 3.5 liters of water. The new SmartCapTM fence-cap from Markers Inc. stays soft and resists cracking and breaking for years. Its bright yellow color heightens player awareness. Easy-to-install rolls (using nylon tie straps) are 25 feet long. The companion SmartScreenTM, which comes in rolls 3 or 6 feet high and 25 feet long. Unlike woven poly windscreen materials, this long-lasting PEM-extruded and molded PVC product won't unravel. The dark green color is UV-stabilized, so fading is minimized. The product provides about 80 percent screening and can be used as a backstop screen. Grit-strip safety surfacing is a tough mineral-coated waterproof non-slip surface with a pressure-sensitive adhesive back. It helps grip foot traffic and prevent slipping. The easy-to-apply surface can be used indoor or out and comes in 1/32-inch thick rectangles with rounded corners, or in rolls cut to any length. It's an effective solution for any high-traffic area, especially at stairs. Grit-strips can tolerate steam or detergent cleaning and are nearly unaffected by climate. Colors include gray, brown, beige, safety yellow or safety red. Koldwave's new 20-ton Aire King is an ideal comfort solution for commercial buildings, schools and other retrofit applications. A single unit can condition 8,000 to 10,000 square feet of space. Vandal-resistant units install easily near an outside wall or converted window opening for outside air exchange through an integral air-cooled condenser. Aire King offers high efficiency, high capacity, dependable operation, and simplified installation and service. Offered in self-contained and split configurations, the Air King's compact design fits through a standard 36-inch doorway and is easily tied into existing ductwork. Heat options are available as well. The new Locker Selection Guide from Lyon Workspace Products is an encyclopedia of locker styling for schools, businesses and institutions of all types. The guide provides colorful photography and detailed product specifications for one of the broadest lines of storage lockers in the industry. Locker options include standard quiet, heavy-duty quiet, heavy-duty ventilated, all-welded, expanded metal, all-welded expanded metal, integrated frame all-welded, and a wide variety of specialty lockers. The guide also offers detailed information on Lyon locker colors, options and accessories, as well as engineering details on recessing and anchoring lockers. Bison Inc. now offers the ClearDefense® Glass Retention System, a special laminate that provides a much needed safety improvement to glass backboards. When applied to the reverse side of a tempered glass backboard, ClearDefense® laminate reduces the potential danger of falling glass by keeping most glass pieces attached to the laminate. ClearDefense® is used worldwide to protect all types of glass from severe weather and aggressive and abusive activities. ClearDefense® can be field-installed onto any make, model or size of existing glass backboard. 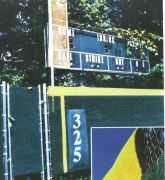 For new or replacement backboards, the system is available factory-installed exclusively on Bison glass backboards.